Toscana Grill in Arlington suffered a burst water main last weekend and will close for renovations for about two weeks. But they decided to make the best out of a bad lot. On May 29, they offered the community FREE FOOD. 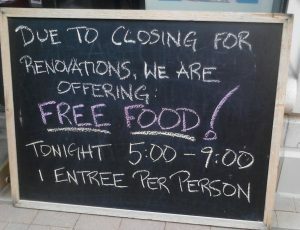 They posted in popular Arlnow in the morning about a free food offer. The article drew a lot of comments but even more retweets, facebook comments, emails to friends, and news spread in offices around the county as one office worker noticed the story and told coworkers. People made sure others found out about this opportunity. People who walked by the restaurant emailed and called their friends and family. Over the course of the evening they served hundreds of meals. The majority were probably to people who had never been to the restaurant. Diners were able to eat out on the patio or had takeout. We interviewed some of them. Folks enjoyed the food. People were wowed by the authenticity and energy of the owner/operator. He took hundreds of orders over several hours…but took the time to chat with little children who had waited in line with their parents. Toscana Grill is a hidden restaurant, nicely located in a well known central Arlington, Va office complex, but on the interior of the courtyard and without street front visibility. Many of the customers this evening lived within blocks or easy access to Toscana. They hadn’t been there before even as it is within easy walking distance. It is hidden, off the main path. We interviewed some and they said they would return when Toscana Grill hopefully reopens around mid June. The power of social media and a well meaning honest story can truly work wonders. Arlnow.com that carried the story is very popular in Arlington, Va, and one of the most successful national examples of hyper-local media. That single story got seen and delivered to thousands of people in the region and hundreds turned up. Knowing the owner we glanced at the total number of comped orders and comped value of this give away. The total dollar value rivaled some of their best days. But that is without serving any wines, beers, or other drinks. It was certainly the largest number of meals they have served since reopening and rebranding this restaurant two years ago. That is the potential power of social media unleashed with a great story. Nobody paid a cent for the meals, but the tip jar did look full. Hopefully the staff was well compensated by generous tipping customers. 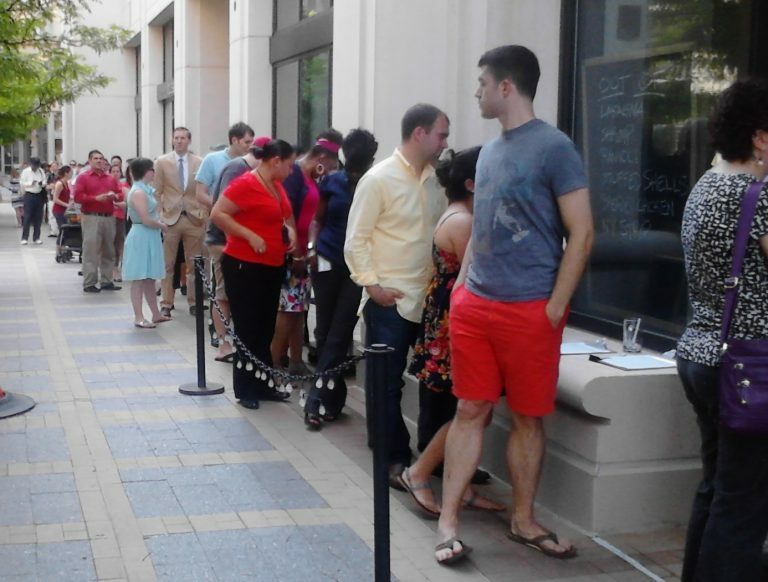 caption: 62 people waiting in line for free food at Toscana Grill. At 4:50 PM there were over 30 people in line waiting for free meals. By 5:10 PM there were 62 people in line, about 20 had already ordered and waiting for their meals on the outdoor patio. Local ABC TV affiliate, channel 8 was filming the waiting line and preparing a news story. Two hours later the line was similarly long at over 60 people and the patio was filled with diners. The line stayed busy til 9:00PM when they ran out of food. We like Toscana Grill. They have hired our graduates to bartend and serve. But more importantly our staff found them to be one of the best restaurants and places to eat and drink in our neighborhood. Hopefully, thanks to the Arlnow article, the power of social media, and the quality of their food, they’ll be back open shortly with even more customers.